Pictured: Community Educator Leah Trujillo and CAV Prevention Director Anthony Harwood at the CAV offices. when they were their students’ age. 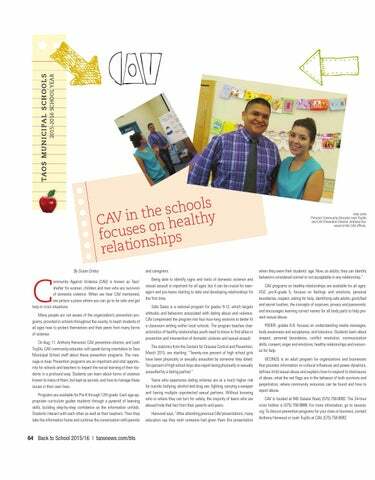 Now, as adults, they can identify behaviors considered normal or not acceptable in any relationship.” CAV programs on healthy relationships are available for all ages. VOZ, pre-K-grade 5, focuses on feelings and emotions, personal boundaries, respect, asking for help, identifying safe adults, good/bad and secret touches, the concepts of surprises, privacy and passwords, and encourages learning correct names for all body parts to help prevent sexual abuse. PODER, grades 6-8, focuses on understanding media messages, body awareness and acceptance, and tolerance. Students learn about respect, personal boundaries, conflict resolution, communication skills, consent, anger and emotions, healthy relationships and resources for help. VECINOS is an adult program for organizations and businesses that provides information on cultural influences and power dynamics, defines child sexual abuse and explains how to respond to disclosures of abuse, what the red flags are in the behavior of both survivors and perpetrators, where community resources can be found and how to report abuse. CAV is located at 945 Salazar Road, (575) 758-8082. 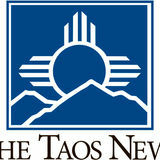 The 24-hour crisis hotline is (575) 758-9888. For more information, go to taoscav. org. To discuss prevention programs for your class or business, contact Anthony Harwood or Leah Trujillo at CAV, (575) 758-8082.